SARANSK, Russia (AP) — Nestled on the edge of the forest outside the Russian city of Saransk is the home of one of the most successful doping programs in history. Athletes from the V.M. Chegin Olympic Training Center dominated race-walking for over a decade, winning nine Olympic and 18 world championship medals between 2004 and 2016, when head coach Viktor Chegin was banned for life amid a blizzard of doping cases. Now Saransk — like Russia itself — wants to rebuild its reputation by hosting World Cup soccer games. Instead of housing athletes juiced with blood-booster EPO or the toxic experimental drug GW1516, the center, which has been renamed but still sports a large set of Olympic rings, will be home to the Panama national soccer team. Ahead of Panama's arrival, a new pitch is being installed and security is tight. With political fallout going all the way to the Kremlin, doping scandals have threatened to overshadow Saransk and Russia's World Cup preparations. Russia was banned from February's Winter Olympics over past doping offenses, and its athletes competed as neutrals — with two disqualified for failed drug tests. 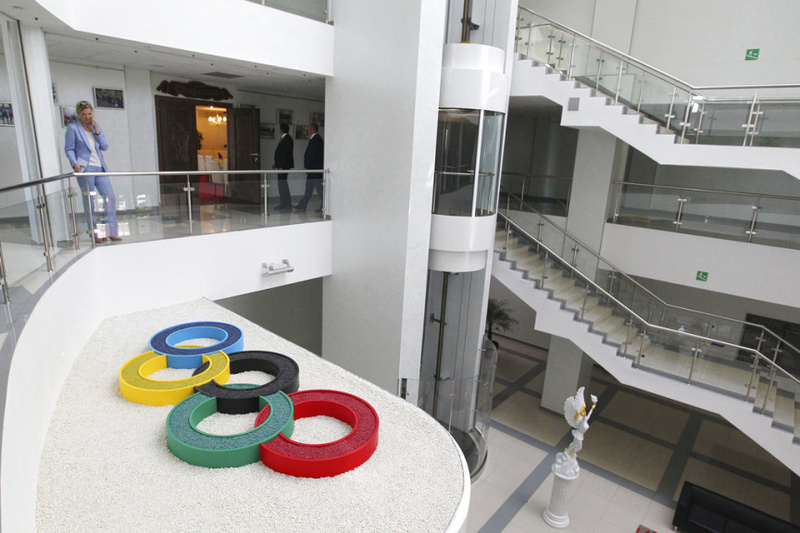 In Saransk, government officials hope the World Cup erases memories of doping scandals. "That ended two years ago. (Chegin) left his job and he doesn't work for us. We don't even know where he is," regional sports minister Vladimir Kireyev said while visiting the center earlier this month. "The whole region is living for its preparation for the World Cup, and we don't have time for such things." However, the Russian Anti-Doping Agency says it has proof top athletes from the region, including a world championship silver medalist, traveled to Kyrgyzstan last month to train with Chegin. Five were excluded from the world team championships over the case. The agency's head Yuri Ganus alleged to state news agency Tass last week that Kireyev threatened an anti-doping executive and that his ministry oversaw "the absence of effective anti-doping measures." Kireyev's office said Monday he'd only comment on those allegations after the World Cup. Russia's doping turmoil has extended into the world of soccer. FIFA investigated the Russian national team defender Ruslan Kambolov this year after evidence he could have benefited from a program of covering up failed drug tests. Kambolov's lawyers have said the investigation was dropped for lack of evidence, though FIFA hasn't confirmed that. Kambolov was named May 11 to Russia's World Cup squad, but removed three days later after the team said he injured his calf muscle. A World Anti-Doping Agency investigation in 2016 published evidence that Russian officials were prepared to cover for the country's 2014 World Cup squad should its players test positive pre-tournament. However, there's no indication any of them doped or that they knew of cover-up plans. The WADA investigation's files also indicate players on the Russian under-19 and under-21 national teams tested positive and weren't punished. The Russian government was implicated when WADA alleged senior officials ordered a cover-up of drug tests around the 2014 Winter Olympics, which Russia hosted in Sochi. The Kremlin fiercely denies the allegations. The lab in Sochi where the cover-up allegedly took place is now a bar selling doping-themed cocktails near the city's World Cup stadium. President Vladimir Putin has branded WADA's star witness, former Moscow lab director Grigory Rodchenkov, a "nutjob" manipulated by the United States. Rodchenkov is under witness protection in the U.S. after fleeing Russia and faces arrest if he returns home. Russian law enforcement claims Rodchenkov made up allegations of drug use at the Sochi Olympics, and instead accused him of tricking clean, innocent Russians into taking banned substances. Russia's shown little interest in investigating possible doping in soccer. Deputy Prime Minister Vitaly Mutko, who is also president of the Russian Football Union, said Friday that performance-enhancing drugs don't exist in soccer. "All that can happen here is marijuana, narcotics, sniffing something," he told Russian media. "I'm absolutely calm about our team over this. We have nothing to hide." Mutko was banned from the Olympics for life in December as part of a package of doping sanctions against Russia. In Saransk, many still see doped athletes as heroes who put the city on the map. In the Chegin center's heyday, crowds of gold medalists trained together each morning on the city streets, watched by admiring locals. Three banned Olympic medalists and Chegin were namechecked in some promotional materials from Saransk's World Cup organizers, which were removed from the FIFA website Monday after an inquiry by The Associated Press. Saransk locals told the AP they take a cynical view of sport. Everyone dopes, and if you're caught, you're either unlucky or a victim of jealous rivals. "Our athletes' hegemony at the world and European championships was too big and the decision was made to remove them," said Alexei Kulikov, who works at a hotel which will house FIFA officials for the World Cup. "Every athlete takes banned substances. Everywhere, all over the world."